The new Xiaomi Black Shark phone offers the company’s first take on a gaming-focused phone and a direct competitor to the Razer phone. In the West, serious smartphone gaming hasn’t managed to catch on in a major way. With the majority of people playing casual games rather than graphically intensive titles, the need for a powerful phone isn’t as apparent. In countries like China, however, the market for a gaming phone is likely much higher – making the new Xiaomi Black Shark phone a smart addition to the smartphone market. The launch of the Xiaomi Black Shark phone comes after an investment from Xiaomi in Black Shark Technology – a major Chinese gaming company that will likely become part of the company’s ecosystem. While the majority of gamers in the West use a PC or consoles to do their gaming, consoles aren’t nearly as prevalent in Asia – but the majority of young people have a smartphone, and the market is booming. By offering an attractively priced phone with specifications that exceed some of the best phones of this generation, the Xiaomi Black Shark phone may stand to capture a significant portion of the mobile gaming market – both inside and outside of Asia. 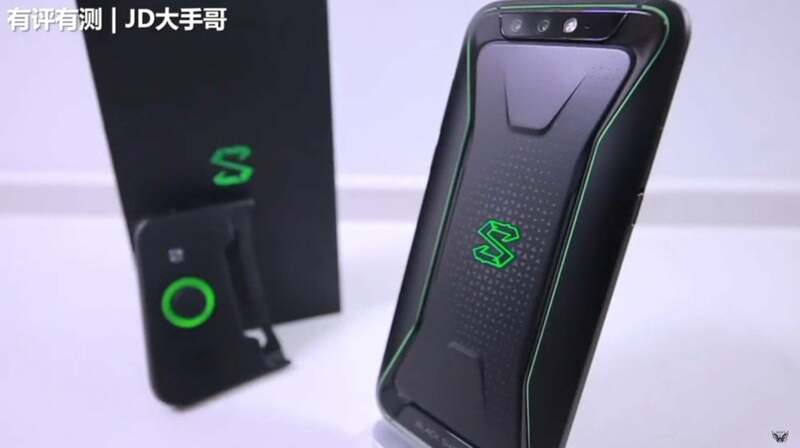 The Xiaomi Black Shark phone seems to take inspiration from the luxury Razer phone, with the same black and green styling we saw from the gaming peripheral company. However, the design is a lot smoother and features curves like you’d see in other high-end smartphones – a dramatic departure from the Razer design that is distinctively square and blocky. As far as the technology powering the phone, gamers won’t be disappointed. With a Snapdragon 845, customers will enjoy the best processor on the market – the same one present in the recently released Samsung Galaxy S9 that has been praised for its power despite other drawbacks. Backing up the Snapdragon 845 will be up to 8GB of RAM, a 1080p 21:9 display, and a 4000 mAh battery. One slightly concerning aspect of the Xiaomi Black Shark phone is that we haven’t seen any mention of a high refresh rate like we saw with the Razer phone – a potential problem for those playing graphically intensive games that require quick reactions. However, the Black Shark may make up for the lack of this feature in other ways: namely, the attachable analog stick that snaps onto one side of the screen. The addition of an analog stick on the side of the Xiaomi Black Shark phone will make it a completely unique offering on the gaming smartphone market. It remains to be seen how the analog stick will be implemented inthe numerous mobile games that the phone will be capable of running, but considering the majority of action games on mobile feature an on-screen joystick, it’s possible that the analog attachment could offer a more convenient way to control their favorite titles. Also unique is the addition of “liquid cooling.” It’s unclear as to what that term means in terms of the Xiaomi Black Shark phone, but considering the fact that a liquid cooled PC takes some extremely specialized equipment, we somehow doubt there is a ton of liquid running through the internals of the phone. Regardless, the company as assured customers that the Xiaomi Black Shark phone will feature temperature reduction of around 8 degrees Celsius. The Xiaomi Black Shark phone is now available to preorder online for 3499 yuan (around $480) for the base model with 6GB of RAM and 64GB of storage. Considering the impressive specifications of the phone, this price is extremely affordable and should make the device a great value for those looking for the best in gaming performance without breaking the bank. Although the mobile gaming market is still pretty niche, it’s pretty big in China where the majority of the phones will likely be sold. It will be interesting to see how the Xiaomi Black Shark phone performs as an affordable phone with high-end specifications. This is the second major gaming-focused effort from Xiaomi, with the Mi Gaming Laptop announced last month.